Good morning polished world! How are you all doing today? It's Sunday and the weekend is almost over. We are also entering my birthday week!! I'm going to be 30....ahhhh. Cannot believe that I'm this old. Some days I feel it, other days I don't. It's weird to me that I'm working an adult job, living an adult life. Other days I feel like I'm still a kid and just got out of high school. Being this age is....odd. Well it's supposed to be in the 90s today, with of course high humidity. Forever and always my favorite weather. Can you sense the sarcasm in that? I'm happy when it's warm out, but not happy when it's humid. It's hard to breath, I feel like I can never cool down, and I'm just all around miserable. 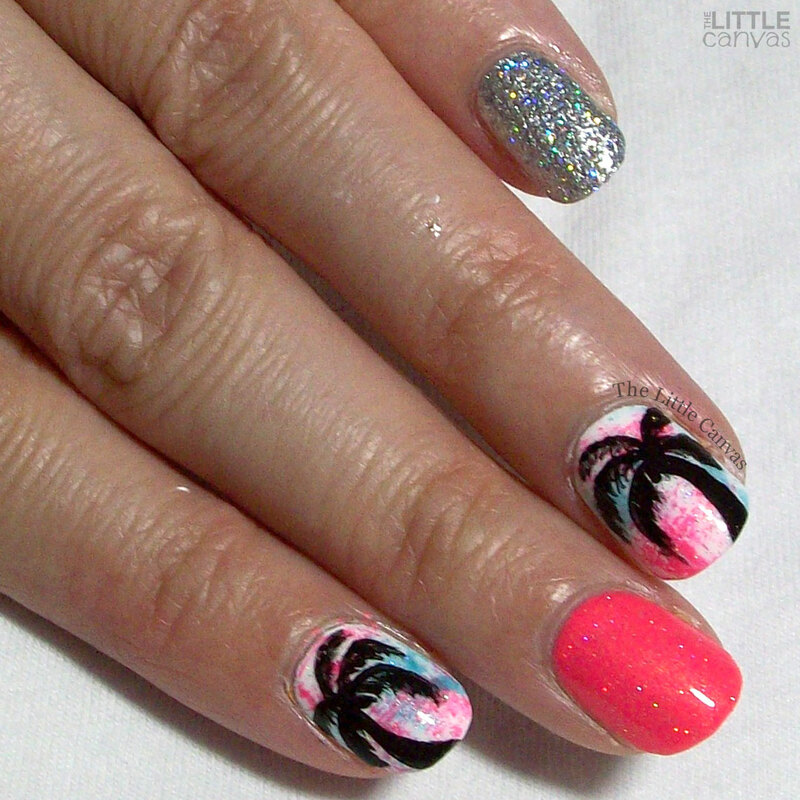 So since it's warm and humid like it is in the tropics, it only makes sense that I share a tropical palm tree manicure using some of my bright China Glaze neons. Let's take a look! Kind of fabulous, isn't it? 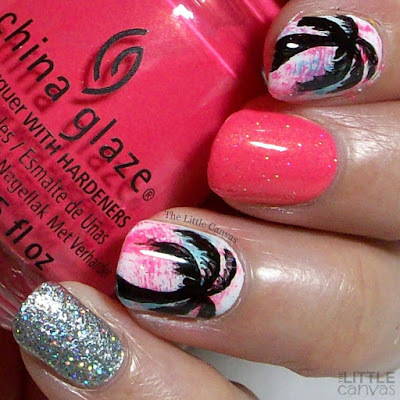 I am in LOVE with the the dry brush background underneath the palm trees. I cannot remember who originally created this look, but I know I was inspired by someone. I kind of hate that I didn't write it down. Regardless, I started off with a base of white polish, then went through with Bite Me and What I like About Blue and did a quick dry brush design. I then added a quick top coat of INM Northern Lights to blend the dry brush and tie in the sparkle of the pinkie accent nail. Plus, Bite Me has a weird formula, so I needed to put a top coat of Northern Lights over that because it looked kind of bubbly. Who knows, that might have been due to the humidity also. Super happy with how my palm trees turned out. Sometimes when I paint them they do not look at all like a palm tree. These turned out perfectly. You can see the little palm leaves, they fit perfectly on the nail. Happy nail artist here. What do you think? Like this fun summer look? Something a little different?